On very chalky ground trees grows bad and i the glades of Allindelille Fredskov a very rich flora with a number of rare species can be seen. The picture at right shows ophrys insectifera, which has its only place in Denmark in Allindelille Fredskov. 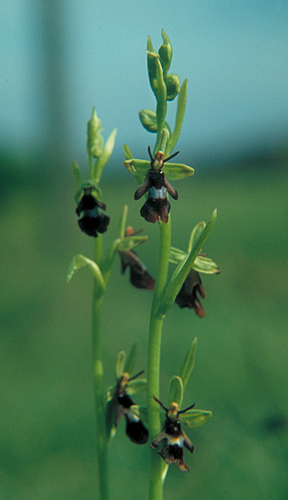 The population of the ophrys has went down due to high vegetation in the glades. But hay moving and artificial pollintaion has stopped the decline. Ophrys insectifera is pollinated by some species of wasps which is near extinction in the forest. And no wasps results in no pollination of the ophrys. The glades of Alinelille fredskov has several other interesting plants. Melampyrum nemorosum (right picture) is one of these with only a few locations on the danish isles. Other species are Galium boreale, Valeriana officinalis, Pimpinella major, Listera ovata (in large numbers), Inula salicina, Cornus sanguineus, Plantago media, Polygala vulgaris, Briza media and Leontodon hispidus. 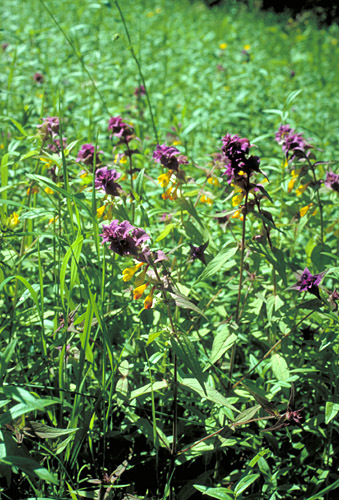 Several species demanding calcerous soil can be found in numbers in the forest as Lathyrus vernus, Melica nutans, Actea spicata, Hepatica nobilis and Carex digitata. 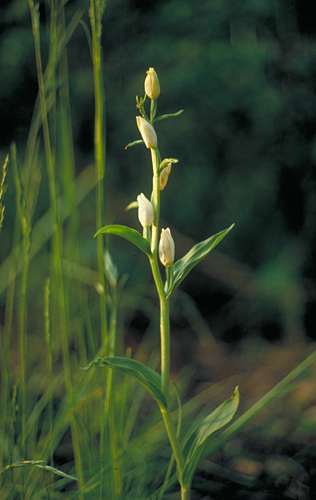 Cephalanthera damasonium (left picture) is another orchid of the forest. This species has several sites in Mid-Seeland. It was not known from Jutland until several plants were found in a rose shubbery in the city of Århus. How the plants has arrived there is still some of a mystery. Back to The forests on limestone in Middle Seeland.